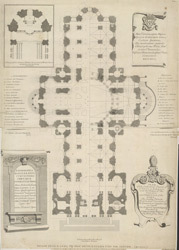 The title of this plan of the ground floor of St Paul's Cathedral appears in a decorative cartouche at bottom right, repeated in Latin in a scroll at bottom left. The plan's scale bar is at bottom centre, with an interpretive key in English and Latin down both margins. An inset plan of the altar features at top left.